We have three magnolia trees in the yard, one white, one pink and this scrappy little bush that mostly hangs over the neighbour's yard. This is my favourite because you can get up close and really smell the blossom. 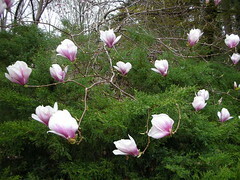 Magnolias are at best a fleeting joy, but this year, with the frigid temperatures that never seemed to end, followed by an immediate rise into the eighties, they are already going over. More photos of the trees in blossom on flickr.